My grocery store has been doing a very good job of catering to my need to immerse myself in all things spring, stat. I walked in a few days ago and was greeted by a huge tower of daffodils. Behind them was an equally large tower of asparagus, and behind that, a sea of red strawberries. Needless to say, I wound up leaving with a cheery bouquet of daffodils, a couple of bundles of asparagus, and more strawberries than I could ever (reasonably) eat fresh so I simply had to bake a treat. 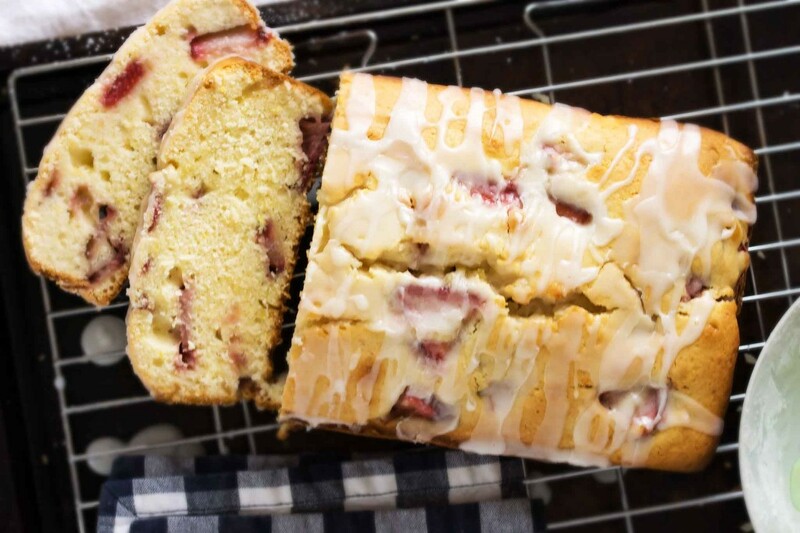 I’d like to call this strawberry-lemon buttermilk bread, mainly because I’m eating a slice with my morning coffee as I write this, but it’s really more of a cake and I’ve got to say, it’s everything I wanted it to be: light, bright, optimistic, and tasting delightfully like spring. 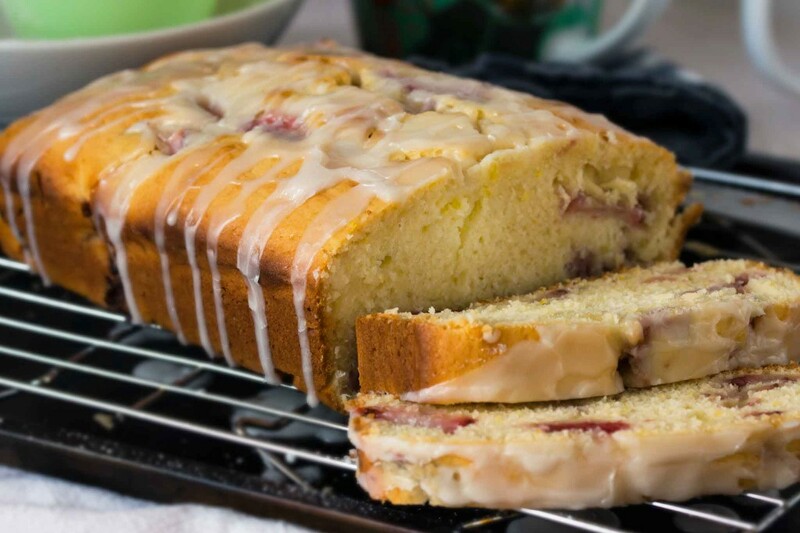 The crumb of the cake is tender and moist, there’s a strawberry in nearly every bite, and the lemon glaze is a much-needed pop of sunshine. Speaking of sunshine, the morning sunshine and long shadows the past few weeks have been incredible. My kitchen window faces east and the promise of that beautiful early light is what pulls me out of bed most mornings. Well, that and the prospect of a hot cup of coffee. 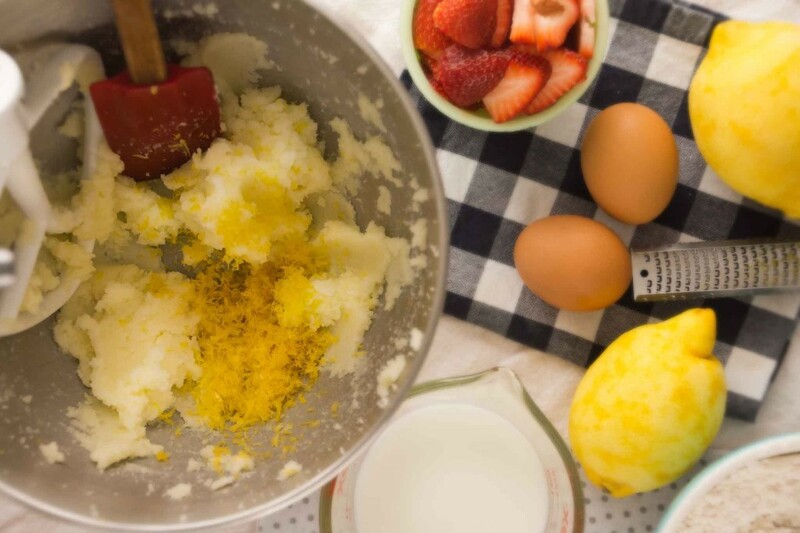 To make the strawberry cake, we’ll start by creaming butter and sugar, then we’ll beat in a couple of eggs and the zest of a lemon. 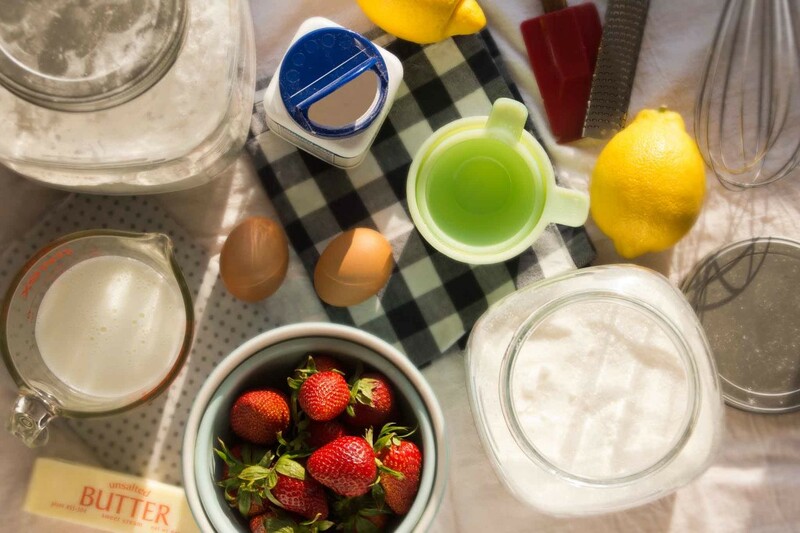 Add dry ingredients between additions of buttermilk and fold in a cup of sliced strawberries. 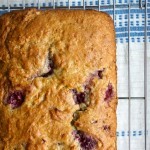 Spread the batter into a loaf pan and pop it into the oven. I imagine you could use a round cake pan or muffin tin, if you’d prefer. When the cake emerges, have patience and let it cool. 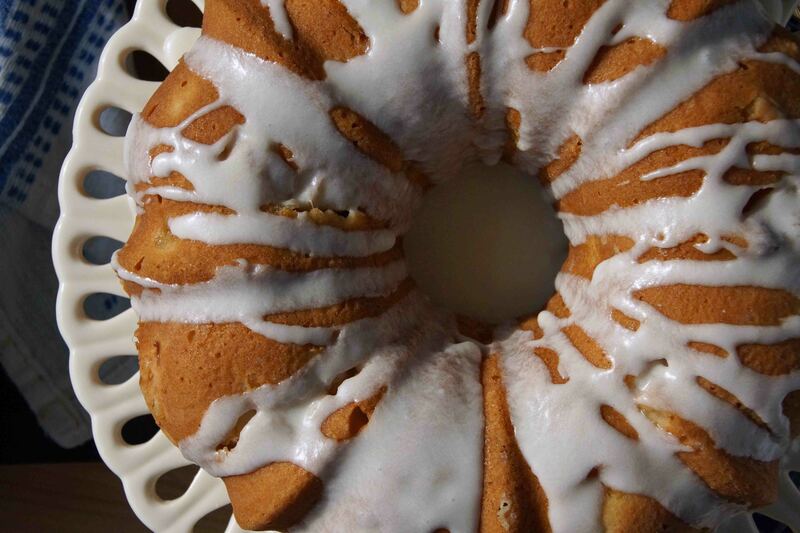 Whisk together fresh lemon juice and powdered sugar to make a spunky citrus glaze. Drizzle the glaze over the cake and let it harden for a moment. 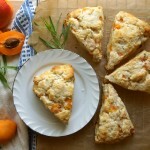 Cut yourself a slice and enjoy a big, bright bite of spring/summer flavor. This cake is absolutely beautiful, as is, with a cup of coffee and that gorgeous morning sun I was talking about. 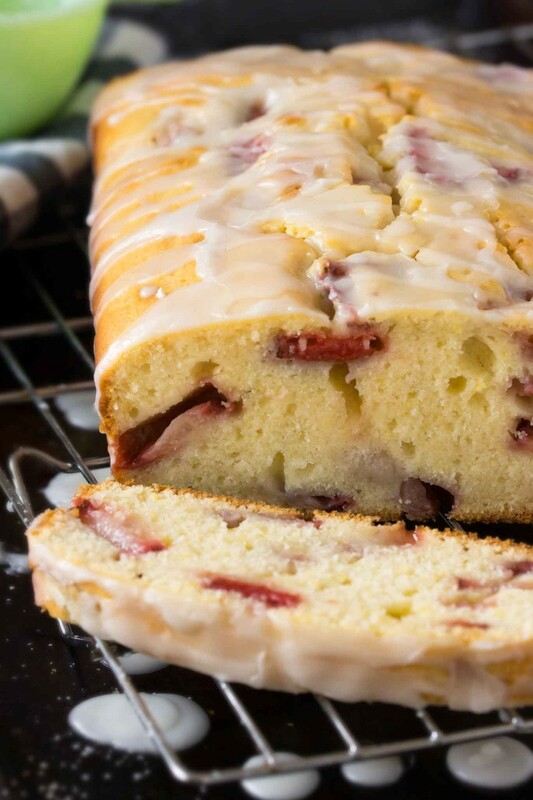 I’d bet if any of it lasts more than a day or two, it’d be delicious toasted and topped with Grand Marnier-soaked strawberries and a dollop of whipped cream. If my next loaf makes it that long, I’ll be certain to test the theory! A slice of this cake is delicious on its own and I imagine it would be great with Grand Marnier-soaked strawberries and whipped cream, if you're in the mood for something more elaborate. Preheat oven to 350°. Butter and flour a 9 x 5 in. loaf pan. I add a parchment sling as well to help lift the cake out of the pan with ease. In a small bowl, whisk together the flour, baking powder, and salt. Set aside. In the bowl of an electric mixer, cream the butter and sugar until light and fluffy, about 3 minutes. Beat in the eggs, 1 at a time, then beat in the lemon zest. Lower the speed and mix in about ⅓ of the flour mixture, followed by ½ of the buttermilk. Repeat and finish with the remaining flour. 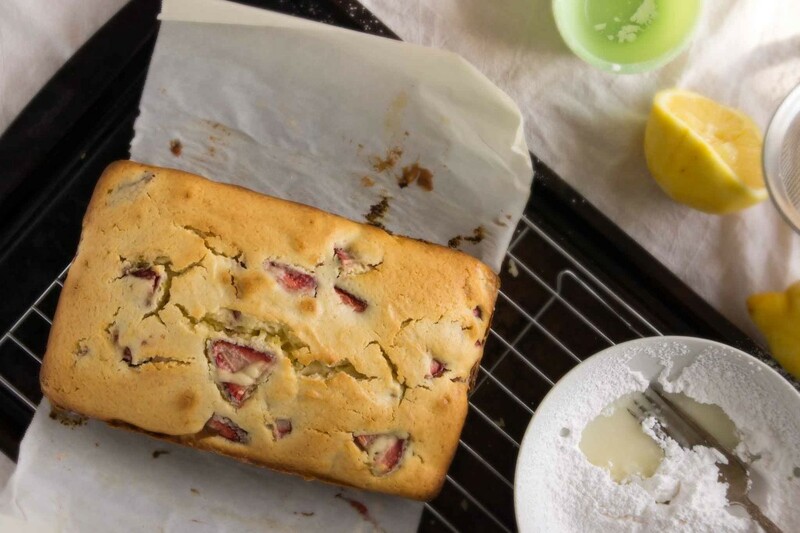 Using a rubber spatula, gently fold the strawberries into the batter. Transfer the cake batter to the prepared loaf pan and smooth the top with your spatula. Bake until a tester inserted in the center of the cake comes out clean, about 1 hour. Allow to cool for a few minutes in the pan, then remove and cool completely on a wire rack. Once cool, sift the powdered sugar into a small bowl and whisk in enough lemon juice to make a thick but pourable glaze. Drizzle the glaze over the cake and let it rest for a few minutes until the glaze hardens. Cut in slices and serve. Looks wonderful! So citrus-y and spring-y! Just made this, in the oven right now. I added a few more strawberries and a tiny bit of vanilla. I didn’t have buttermilk on hand, so I just used some lemon juice in milk…crossing my fingers that it has the same effect. thanks for the recipe, it smells delish! I hope you enjoyed eating it as well as smelling it! Hi! Does this recipe just make one loaf? And about what size loaf pan did you use? Thanks! Copyright © 2019 Strawberry Plum | Site by Viva la Violette.